A couple poses for an iPhone snapshot during their wedding at the Bang Rak wedding event on Valentine's Day. Valentine's Day is a big deal in Thailand. At first blush, it might seem odd that Buddhist Thailand celebrates a day that venerates an Italian Catholic saint. But it's really not. 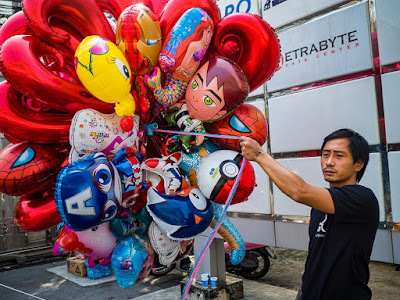 Christmas is very widely celebrated in Thailand, especially in urban areas, and All Hallows' Eve, better known as Halloween, is becoming more popular in Thailand. All Hallows' Eve was originally the time in the liturgical year dedicated to remembering the dead, including saints (hallows), martyrs, and all the faithful departed and is very closely tied to the Latin American Catholic Day of the Dead. A couple waits for their wedding to take place. When Thais celebrate Valentine's Day or Christmas or Halloween they aren't celebrating the spiritual nature of the day. They're celebrating the fun nature of the day. On Christmas, it was the parties and giving of gifts. On Halloween, it's the parties and costumes. Thai children don't usually go door to door soliciting sweets or threatening mayhem, but their parents do get dressed up and go out to parties. On Valentine's Day it's the romance, the giving of flowers and gifts, the fun aspects of the day. Many Thais get officially married on Valentine's Day, believing it to be an auspicious day to get hitched. 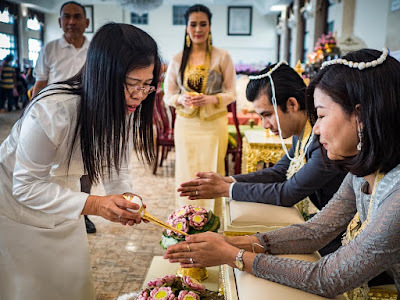 Most Thais essentially have two weddings - an elaborate wedding presided over by monks and usually include a big party and then a very brief civil wedding at a government office where the wedding is recorded as being official. The elaborate wedding may last hours or even days but the civil wedding in a government office is done in a matter of minutes. 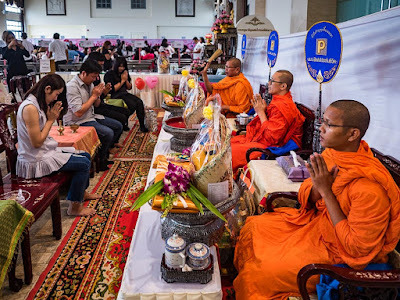 Buddhist monks bless newlyweds during the mass wedding event in Bang Rak. In Bangkok, an area known as Bang Rak is by far the most popular place to get married on Valentine's Day. Bang Rak is one of the oldest neighborhoods in Bangkok, the name of the neighborhood translates to "Village of Love," (Bang = Village, Rak = Love) and people flock to the local city offices to get married there on Valentine's Day. It's such a popular day that officials moved it from the cramped confines of the local offices to the old General Post Office, a beautiful historic building that has been converted to an event space. Newlyweds participate in a blessing. 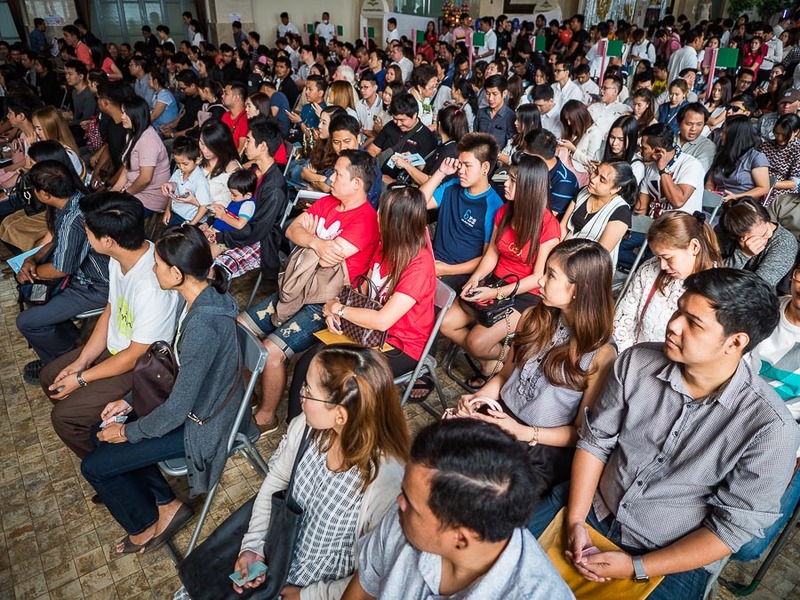 Hundreds of people go to the old post office to get married in the eyes of the government. It's become such a big deal that many companies set up booths to help the couples mark their special day. Private clinics promote family planning. The government promotes fertility treatments. 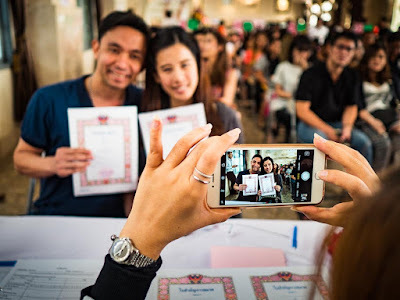 (Thais are having fewer children and the population is aging out, so the government is trying encourage married couples to have children.) Dentists promote tooth whitening. Financial planners promote financial planning. And there are food vendors, photographers, car dealers, lottery ticket sellers all hoping to make a Baht. Couples wait for their turn to be called so they can have their civil wedding. It's a fun event but it's not quite like photographing a mass wedding in the US. Because it's "just" the official part of the wedding, many Thais don't view it as a wedding at all. "The" wedding, the one that matters, is the one that's held in their home village with the monks and the music and the party. The civil wedding is more an onerous chore that has to be completed to satisfy the government. 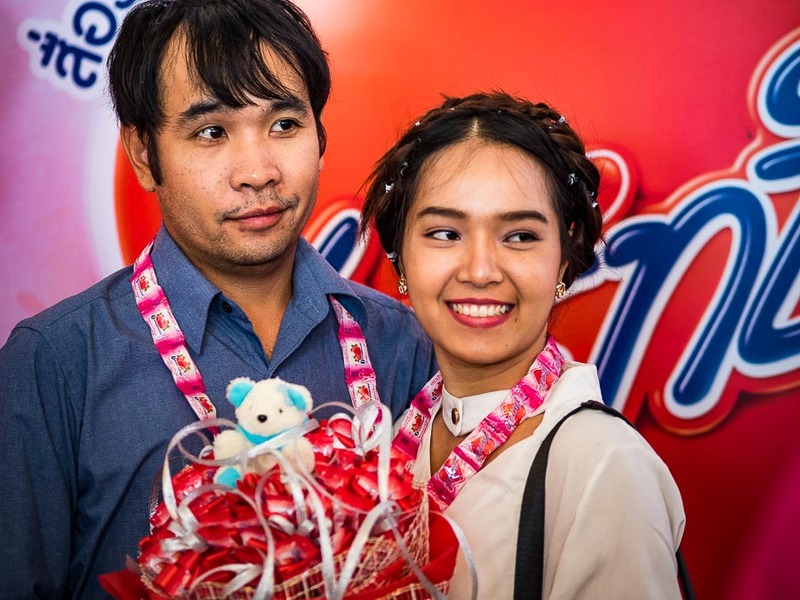 A couple is tied together in blessed matrimony at a booth sponsored by a beverage maker. While another couple waits to be photographed in another booth. The bouquet and teddy bear are props, returned after the photos are made. Some people went just long enough to register their nuptials, others made a day of it. Valentine's Day is not a legal holiday, so people had to arrange for time off to go to the mass wedding ceremony. That's easier for some than it is for others. A toy vendor waits for customers at the mass marriage event. There are more photos of the mass marriage day in my archive.